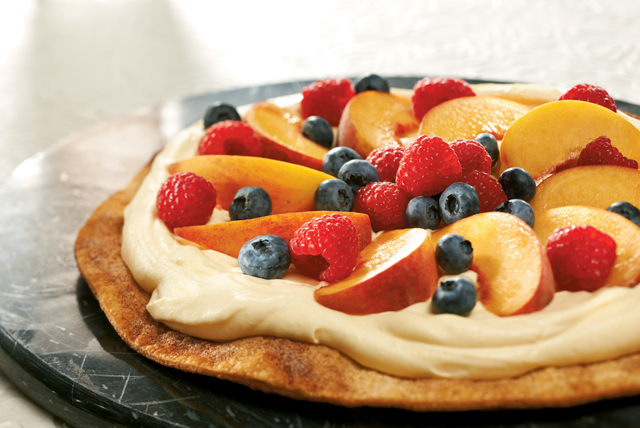 Enjoy our easy Flat-Bottom Fruit Pie that will make the most of your summer's sweetest fruit, with fresh peaches and berries on a layer of vanilla pudding. Unroll pie crust onto baking sheet; sprinkle with cinnamon sugar. Bake 8 to 10 min. or until lightly browned; cool completely. Meanwhile, beat pudding mix and half-and-half in medium bowl with whisk 2 min. Stir in COOL WHIP. Refrigerate until ready to use. Spread pudding mixture onto crust just before serving; top with fruit. Save 50 calories and 3g of fat per serving by preparing with fat-free milk, JELL-O Vanilla Flavor Sugar Free Fat Free Instant Pudding and COOL WHIP LITE Whipped Topping. Substitute milk for the half-and-half. If you don't have cinnamon sugar, you can mix 3/4 tsp. sugar and 1/4 tsp. ground cinnamon instead.